Pearce Bunting and Shawn Hamilton in THE GREAT SOCIETY. Photo by Scott Pakudaitis. 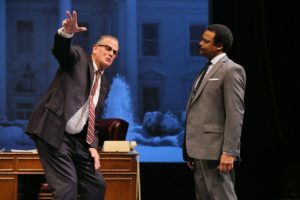 Pearce Bunting plays Lyndon Baines Johnson in Robert Schenkkan‘s theatrical (and loud) The Great Society (History Theatre) with none of the crude charm, the country-boy excess, the rude physical bullying that I’ve come to associate with our former president. Bunting’s LBJ is sweaty, angry, paranoid, much given to fierce screaming and manipulation. He lacks an accent and, as I said, the creepy LBJ magic. The question is: is this a performance choice? Is this the way Schenkkan and director Ron Peluso see LBJ? It doesn’t jibe with my LBJ expectations, but then this is the joy of History Theatre plays, that they teach you something, allow you to make discoveries, they give the unexpected real onstage presence. In this, The Great Society succeeds grandly. It makes sense that a History Theatre play is exposition-heavy; The Great Society has a lot of information to impart. It deals with LBJ’s chagrin at the way he has to compromise his Great Society welfare programs in order to pay for the war in Vietnam. It also deals with Johnson’s inability to respond meaningfully to the challenges of the Selma civil rights march and the riots in Watts and Chicago. The Great Society details J. Edgar Hoover’s building White House power (Hoover’s U.S. is chockful of dangerous “subversives,” including Martin Luther King and all the anti-war protesters). The play gives us information, and more information. For three quite lengthy hours. Moreover, The Great Society deals with material that has been well developed in other media – and not that long ago: the recent film Selma; Ken Burns’s magisterial Vietnam documentary; the excellent HBO series The Path To War; Christopher Hampton’s Appomattox, recently presented at the big G. That The Great Society was rehashing historical material I already knew made it something of a slog. But the performances are excellent, and herein lies the joy of The Great Society. Bunting’s work is delicious. Shawn Hamilton plays Martin Luther King with sensitivity and intelligence. (Here is an object lesson in how an actor can underplay a role and steal every scene he’s in.) As Robert McNamara, Eric Knutson makes us vividly feel the poor man’s building guilt. And Jennifer Blagen overcomes the sucktitude of her wig and plays Lady Bird with sensual power. The play has delirious theatrical oomph; kudos here to director Peluso. Energy never flags. One final note: parking was a horrorshow. Not only was the Scientology ramp gruesomely expensive ($15), we had to wait interminably just to get out. My firm advice: make sure the Wild aren’t playing at home. And bring a pocketful of quarters and park on the street.